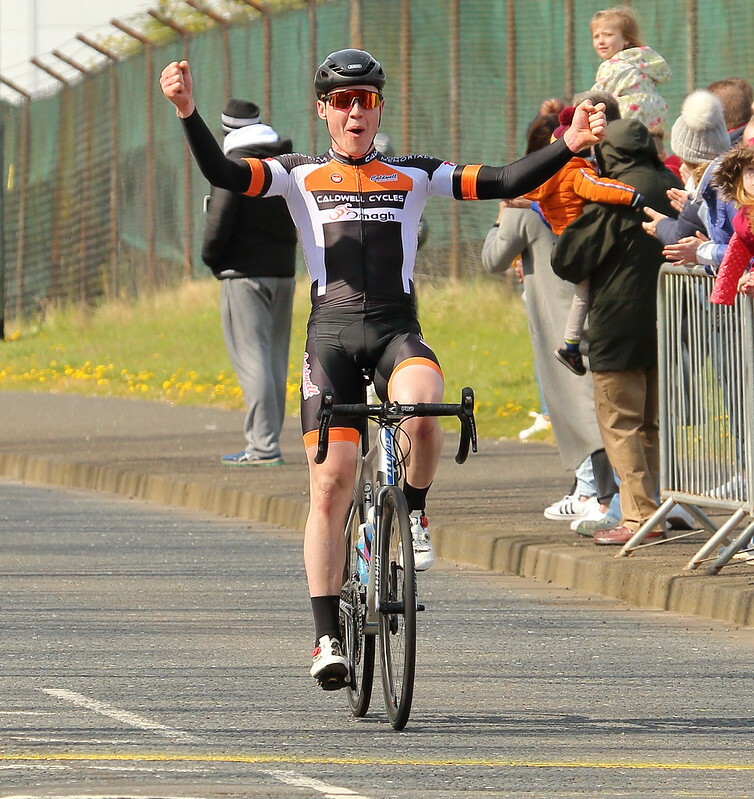 Last year Gary Donaldson won it for Caldwell Wheelers, this year Darnell Moore took the win for the Tyrone Team after a hell of a day with high cold winds. What a day we had on the Antrim roads today, gusty icy winds, 2 climbs to say Sir to and the peloton of 80 riders split into pieces from as early as 10km in the race with the danger men up the road in two groups who managed speeds due to the tailwinds of over 60km an hour at times. The climbs where awaiting for the leading 2 groups which made another selection up front and the bunch already nearly 3 minutes down at the top of the Springwell with sidewinds who made it nearly impossible to get back to the front from some lads who missed the breaks and it was more preparing for the headwinds going back to Ballymena who hit them hard..by that time a group of six has formed up front and they went to the line in Galgorm. To finish the story of today we just have to say chapeau to the promoting club Ballymena RC and his volunteers, the expertise of the comms to control such race in the wild conditions with riders as far as 3 miles behind in the end, the PSNI with their outriders and control landrover, the timekeepers and my favourites of each race..the tea ladies..just love them as I never come hungry away from the Ballymena RC headquarters and so does no one else. Here the link to the photos of our Flickr cloud taken by David Mc Veigh from our media team, and more photos will be added in the next few days, but here a taster of his brilliant work for now, just click on the photo and bob is your uncle. PreviousCan Sagan retain the title…of course he can …Provisional entry list for Sunday’s Paris-Roubaix includes Ryan Mullen! Belgian Project bursary holder Drew Armstrong (Enduro-Tech Monkey-Killinchy CC) of to Italy for the worlds! !